Miranda Professional Corporation evolved from a freelance accounting business started by our founder, Joseph Miranda, in 2001. Joseph has dedicated his energy to service the specific needs of the small to mid-size enterprise and work to resolve the continuous challenges entrepreneurs face in leading their businesses. In his twenty-five-year career, Joseph has grown along with the industry. His relationships span a diverse clientele, which includes physicians, restaurateurs, investment companies, and a variety of entrepreneurs. As important as these direct-client relationships, are those that have been built with fellow accountants who rely on our comprehensive services to handle their growing need for qualified accounting and bookkeeping personnel. 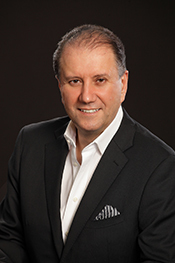 A Chartered Professional Accountant and Certified Management Accountant, Joseph Miranda began his career with a Bachelor of Commerce Degree from the University of Toronto. He acquired invaluable experience while employed in the public accounting firm of Lipton Chartered Accountants. During this four-year period, Joseph built a strong rapport with the partners, clients and colleagues, which formed the foundation for his business and commitment to high standards of service, and a strong perspective on innovation and practicality. Prior to starting Miranda Professional Corporation, Joseph spent 10 years as the Controller for a mid-sized graphic solutions business where he centralized the estimating function and developed a software application to accurately determine quotations for customized orders, stabilized operating costs, implemented a credit policy, expanded sources of finance, and prepared strategic business plans. Joseph currently leads a team of individuals who share his passion for accounting processes, financial reporting, strategic management, and corporate and personal tax planning. MPC is a solution-driven practice that focuses on helping small to medium-sized enterprises develop and achieve their objectives. We facilitate growth by providing up-to-date bookkeeping and accounting services, financial reports, and by sitting down with key players to create strategies for tax preparation. The qualified CGA’s, CMA’s, and CPBs that form the MPC team have a specific skill set as well as creativity through which interactive models and strategic planning are achieved. By simplifying these strategies, we empower the entrepreneur to build his or her success from a solid platform based on accurate financial and statistical data. MPC has established longstanding relationships with clients and other accounting firms. Our commitment to confidentiality and communication is well-known. Clients know that they can trust us to handle their important projects with discretion, creativity, and the dedication to provide the end-user with the valuable information they need to make confident financial decisions.